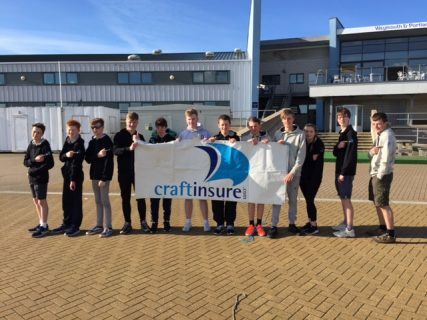 E Howard-Davies Youth Training Week – Day 1 – Thank you Craftinsure! 8 UK sailor and 4 Irish sailors arrived at Portland on Sunday 9 April for the E Howard-Davies Youth Training Week and were issued with smart team hoodies kindly donated by Craftinsure. On Monday morning house parents Gill Beddow and Adam Chaplin brought the sailors down to the dinghy park early so they could get their boats rigged before sitting down to an all they could eat breakfast. The sun was shining and the conditions great for training so SI Storm Nuttall and guest coach Mike Senior were keen to get them on the water as soon as possible. After a short session of land drills they launched for the first of two sessions of tacks, gybes and spinnaker hoists to improve boat handling. After their debrief and supper Storm took them over to chill on Chisel Beach and make the most of the sunny evening.